With a more powerful engine than our smallest model, you can collect leaves faster and chip branches up to 2" thick. The Pro model lawn vacuum holds up to 306 gallons of mulched debris — the equivalent of more than 70 large garbage bags of unshredded leaves! Performance: The Pro features a powerful 9.00 ft. lbs. torque Briggs & Stratton OHV engine with a cast-iron cylinder sleeve. The massive Shark-Teeth Impeller has a Lifetime Warranty. 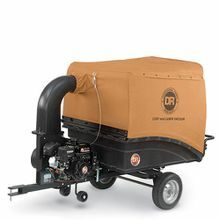 A patented Centrifugal Separator separates dirt from the airflow, reducing dust. And the durable polyethylene and PVC collector box stands up to the weather, and will never crack, tear or rot. Maneuverability: A Single Point Hitch offers the greatest in maneuverability, especially when working in tight quarters.